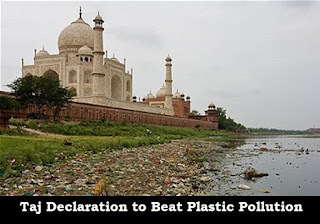 Taj Declaration to Beat Plastic Pollution’ was adopted by India recently to make the 500-metre area around the 17th-century monument litter-free. Steps would also be taken to phase out single-use plastic there. The government of India has pledged to end disposable, or single-use plastic around the Taj Mahal and the declaration came ahead of the World Environment Day on June 5. Union Culture Minister Mahesh Sharma, who is also the Minister of State for Environment, United Nations Environment Programme Executive Director Erik Solheim and UNEP Goodwill Ambassador and actor Diya Mirza, adopted the "Taj Declaration" that aims to rid Agra of plastic, in line with this year's theme for the World Environment Day -- "Beat Plastic Pollution". The Taj Mahal is turning yellow and green in the world's eighth most polluted city. One of the seven Wonders of the World, the 17th-century mausoleum flanks a garbage-strewn river and is often enveloped by dust and smog from belching smokestacks and vehicles in Agra. Environmentalists and historians have long warned about the risk of soot and fumes from factories and tanneries dulling the ivory monument.